The third bike is almost done, but I thought I'd write a post first about some of the people I've met along the way. I'm not a political person, I'd much rather design and build projects. It's been my experience that the things that really matter in life are usually done by people first, and then a couple of years later the politicians figure it out. However my solar electric cargo bikes have been at 80 or 90 events since 2012, and I also have had two bike blenders since 2007 that have been to even more events than that, so I've met a few politicians along the way. The bikes have been very public, and I've unwittingly become a bicycle advocate. 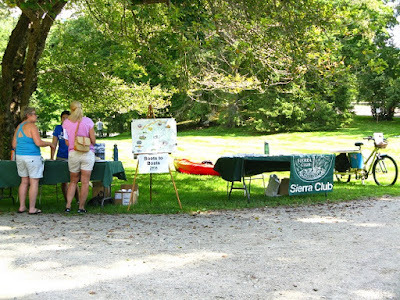 The events for the last 4 or 5 years have usually been for my town's energy committee or the Sierra Club Upper Valley group or the SC Vermont Chapter. 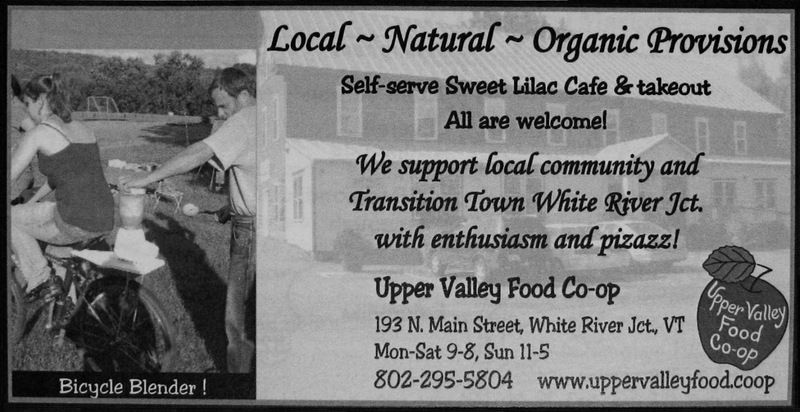 Before that it was our regional Farm to School food program, and also our local Transition Towns group. This post is really about friends I've met along the way. Vermont is from "vertes montagnes", which means "Green Mountains", and our love for our forests doesn't really have any political boundaries. The early events were focused on local agriculture, business, and sustainability in general, but lately transportation has become a stronger focus. 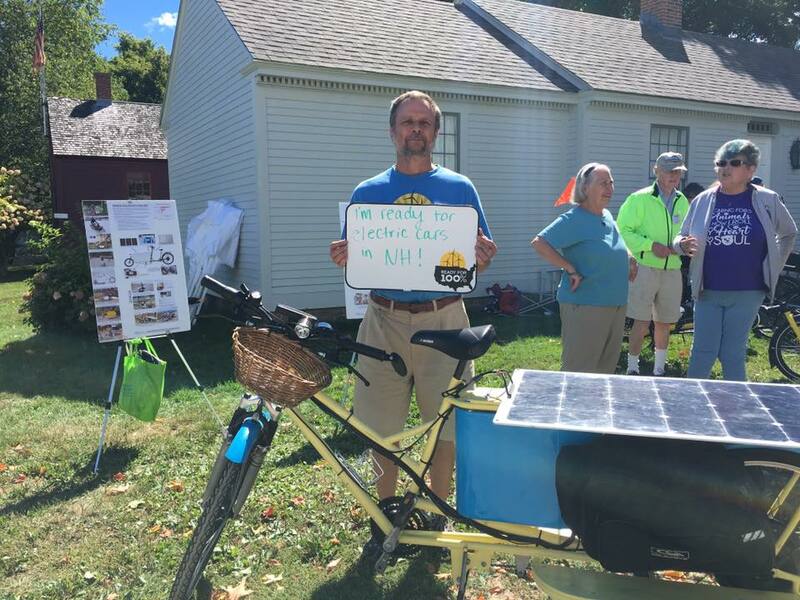 Transportation is Vermont's largest source of pollution, responsible for 46% of our carbon emissions. I've helped organize a lot of Electric Vehicle actions over this time, but bikes are still my first choice for cleaning up our transportation. This is special to me, as the only other Secretary of Transportation that I've seen on a bike is Janette Sadik-Khan, Commissioner of NYC DOT, and she was riding just a regular bike (well OK, a bikeshare bike). I give Sue a lot of credit for trying out my bike, and of course I hoped this would translate into more bike lanes. I've had the chance to talk with our current Transportation Secretary Chris Cole twice now, and he understands the need to include bikes in our transportation mix (see our state report "The Decline of Driving: Navigating Vermont without a Car", January 21, 2015), and he supports electric bikes because of our rural and hilly terrain. 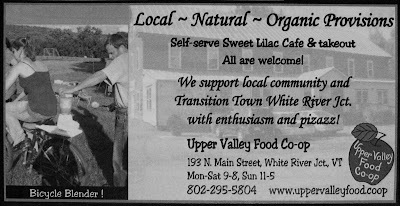 We held a series of annual Farmfests that celebrated our local farms, which eventually resulted in their produce being included in school kid's menus around the Upper Valley. 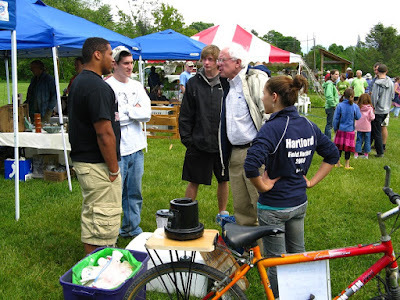 Bernie Sanders attended in 2009. 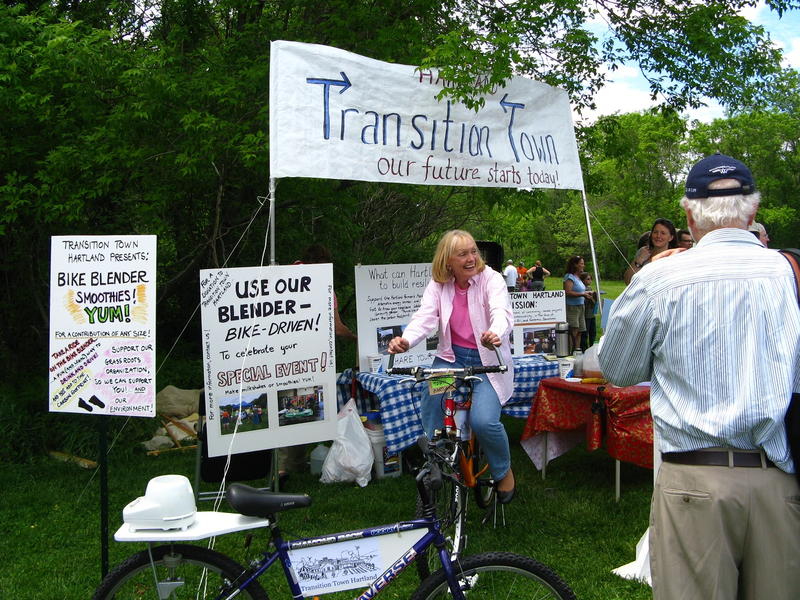 Eric Dicke and I had built the red blender bike for our Transition Town group, and Nora (in front) was running it for the day. Bernie came over and talked with the high school students that were hanging around, asking them about their plans for the future. 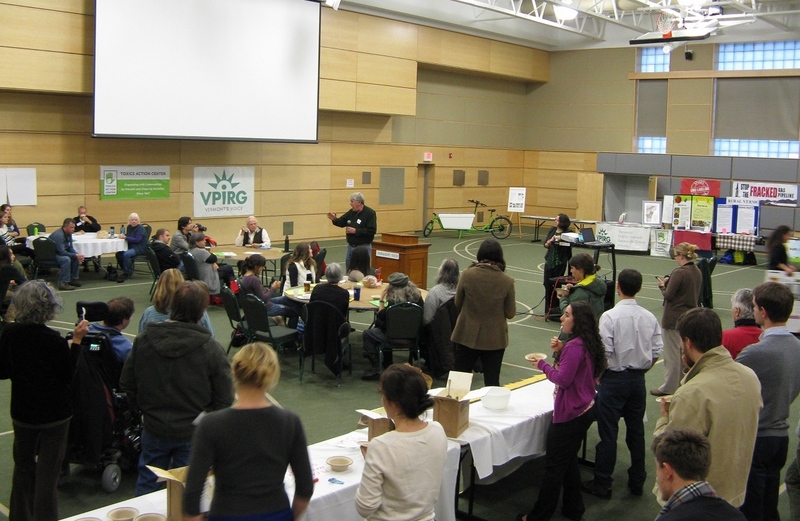 After giving speeches along with VT Secretary of Agriculture Roger Albee, Senator Patrick Leahy answered questions, (in the group visible in the back of this photo), while his wife Marcelle made smoothies. We had made the red blender bike that Marcelle is pedaling first, but the 26" tire frame was too big for many elementary school kids so we had to make the smaller blue blender bike. Both bikes are still being used several times a year at regional events (although they really could use new tires). 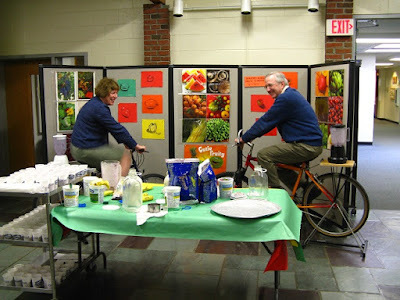 Often they are used by elementary schools (kale smoothies from their school garden yum! 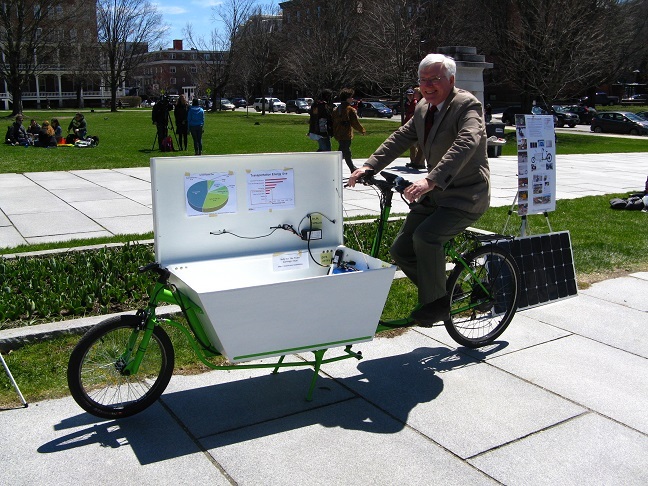 ), community groups, food coops, parks, and other town energy committee events, but this past spring they were also out at the Hypertherm Plasma Cutters green week promotion (for the third time), as well as a Tuck School of Business Sustainability Club Social (one of several times they have been at Dartmouth college). This is Will Allen, co owner of Cedar Circle organic farm in Thetford, author of "The War on Bugs", GMO labeling advocate, and host of many Strawberry festivals that I've brought both the bike blenders and solar electric cargo bikes to, (as well as Solar Hartland solar displays). 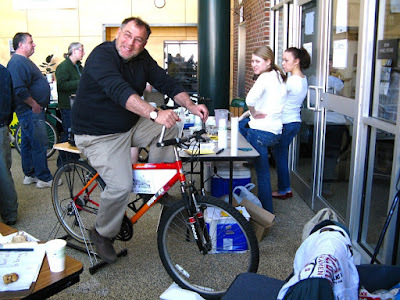 Tom Kennedy of the Southern Windsor County Regional Planning Commission, helping the Springfield High School Students fund raise at a smoothie booth at a Springfield region Energy Expo. Change The World Kids is a Woodstock High School group where kids explore our natural world and what it means to us. 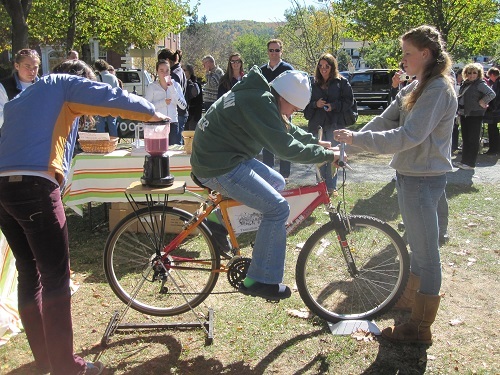 They've borrowed the bikes for several events, such as this Energy Fair on the town green back in 2010. The Middlebury college student group 350.org was just picking up momentum with the guidance of Bill McKibben at the time, and they helped with this fair. 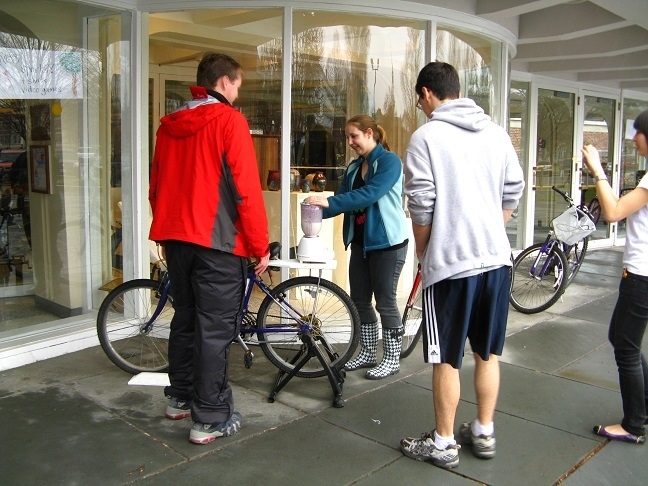 The blender bike was used as part of an energy awareness display. 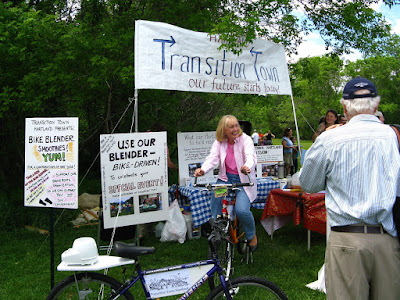 My local food coop held a summer celebration at one of the community gardens, and we made smoothies for a treat. 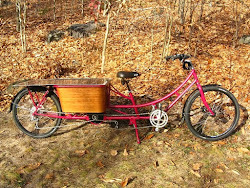 They ended up using a photo of the bike for their listing in the national coop directory. My Elementary School Principal Judy Callens and Town Manager Bob Stacey make smoothies at the school during National Healthy Eating Week. The kids were very enthusiastic- teachers had to designate students (i.e. ration biking time) from each class for pedaling. They made a different color smoothie each day of the week, this day was blueberries. The bikes have also been at our annual Trek to Taste regional celebration five times, which is about local food and has displays from the kids about their school gardens. 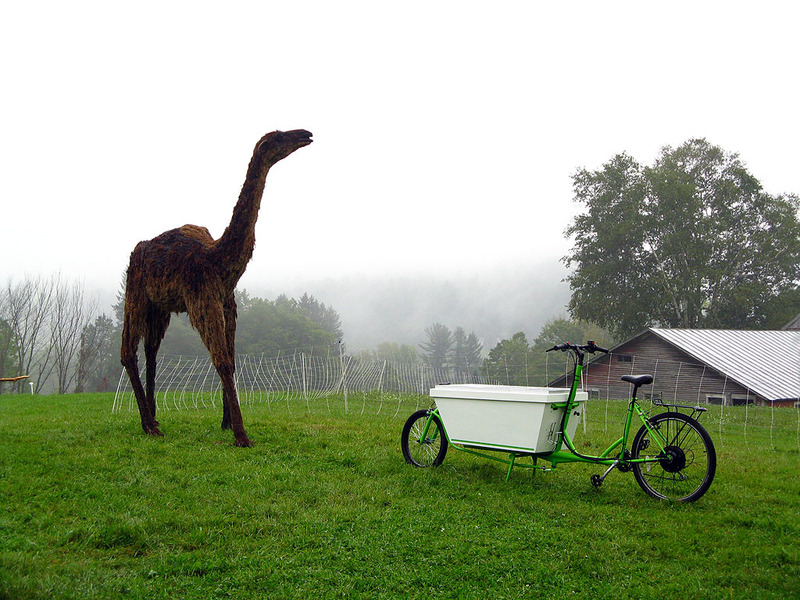 The North American camel meets solar electric cargo bike. Although not directly political, (artists do have their share of political drama though), this photo from the mists of time is special enough to repost here. I had curated 4 environment and climate art shows at my town library, and as a result was participating with the bikes in Sculpturefest 2013 over in Woodstock. This Aepycamelus (tall camel) was widespread in North America about 20 million years ago, and became extinct about a million years ago because of the last ice age. This sculpture is made entirely of brush and flowers collected from the fields, and the artist did such a good job that the sculpture looked real. 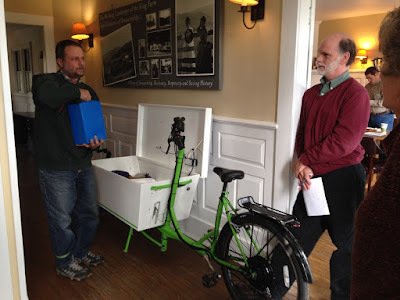 I gave a talk about the bakfiets in 2013 at my Two Rivers Regional Planning Commission, to the Transportation Advisory Committee (TAC) representatives from area towns. 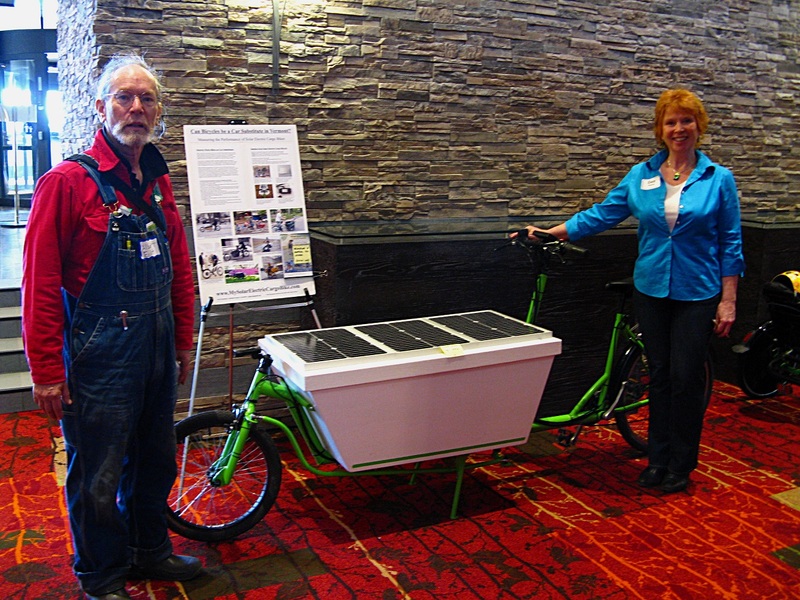 It was great fun, and I also met Gina Campoli of VTrans for the first time, when she gave her presentation about Vermont Electric Vehicle programs. I'm now working on EV issues for the Vermont Sierra Club and appreciate the work that she and others in state agencies have done to build EV numbers in the state. Afterwards we took the bakfiets outside for test rides (aka playing with bikes). Getting back closer to political biking advocacy, Bike Aficionado Albert Echt and Go!Vermont program consultant Deb Sachs talk bikes at the 2014 Vermont Walk and Bike Summit in Burlington. This was the beginning of the solar bike discussion at the state level. Go!Vermont program Director Ross McDonald arranged for the longtail to be in a pilot study last summer at the Vermont Department of Transportation. It was part of their bike pool, and this is a picture of it in the lobby with a sign out sheet. 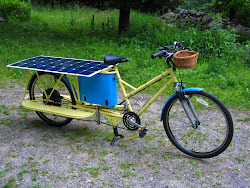 During last fall's Vermont legislative session a bill was passed that defined electric bikes as having the same legal standing as regular bikes, and our legislature decided to allow 1000 watts of power (a bit above the federal consumer products safety limit of 750 watts), which was a good step for making both cargo and everyday working bikes more feasible in our terrain. 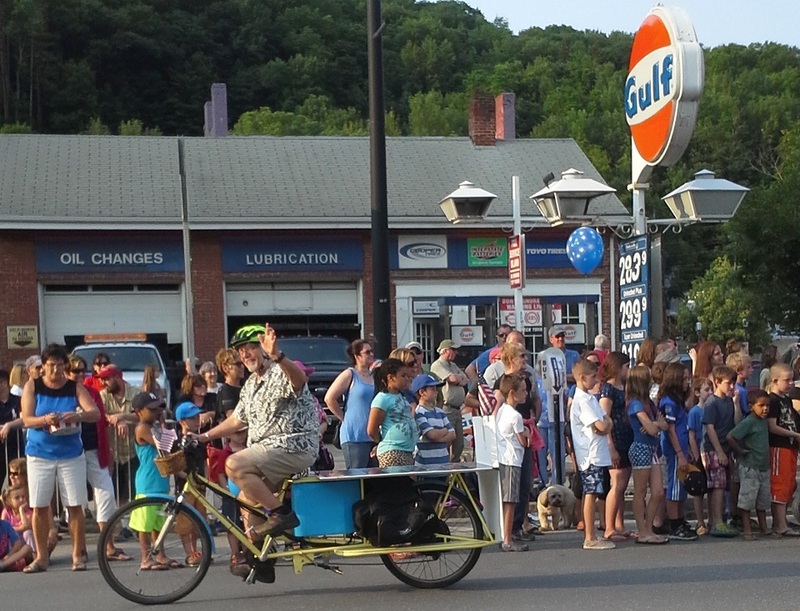 The longtail also took part in last year's 4th of July parade in Montpelier, ridden by Robert Atchinson, one of the railroad administrators from VTrans. He put a poster board explaining the bike on the back, and enjoyed passing by the gas pumps. I've also brought bikes to the Vermont Toxics Action Center conference at Vermont Technical College, (you can just see one in the back corner of the photo above). Toxics Action is a New England coalition that works to clean up polluted areas. 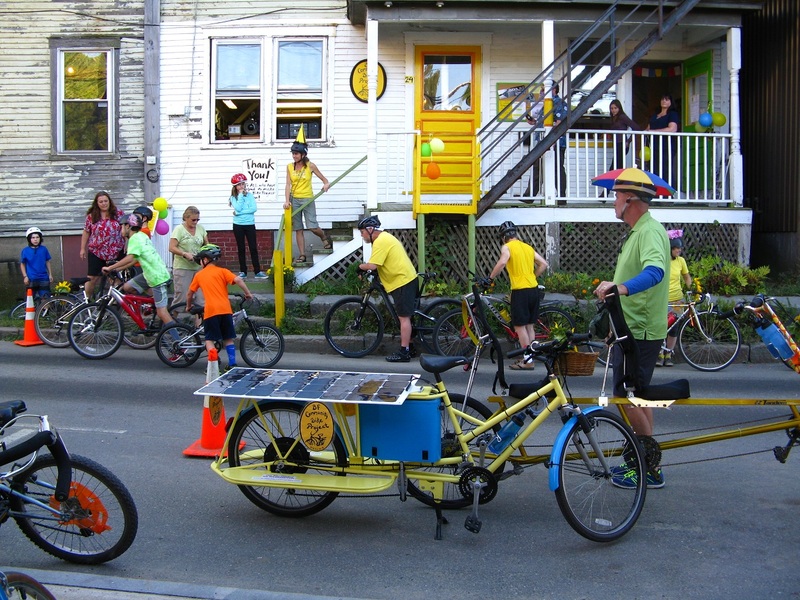 The Bellows Falls Community Bike Project 1 year anniversary celebration! Lately I've also enjoyed teaching about the bikes, such as at this SkillShare event last June. Although this class was about the basics of converting a bike to an eBike, I had brought along a demonstration hub motor that I'd converted to mid mount use (it's now an in runner with the shaft spinning instead of the outside case) to take apart, and everyone was eager to see what was inside. 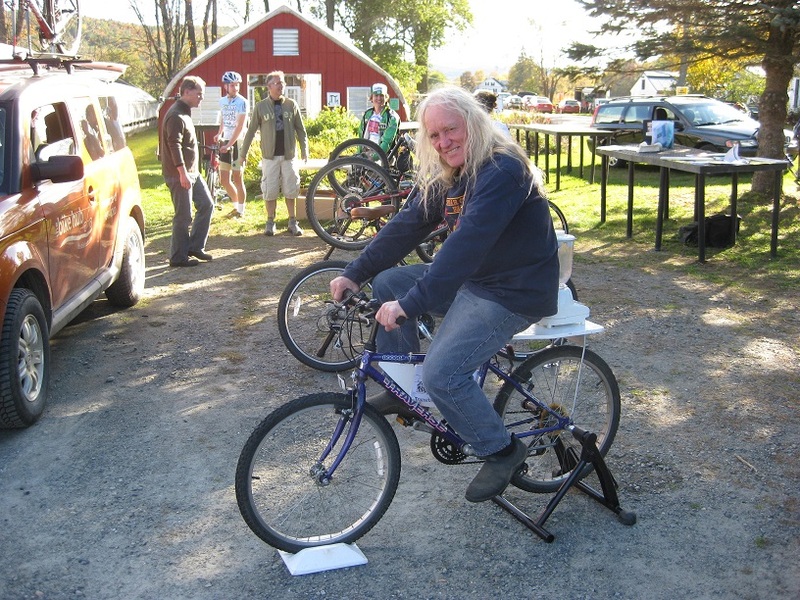 I don't think the people attending will be getting that involved in their projects, but I wouldn't be surprised to see a few regular eBikes built- there were several members from a nearby Quaker community attending that have been self sufficient and energy efficient for decades that wanted to be able to use their bikes more. I've also been attending the Vermont Transportation Efficiency Network (VTEN) meetings, which are all about everything except the Single Occupancy Vehicle (SOV). One of the members is Stagecoach transit in Randolph, and I brought the longtail to their 40th anniversary celebration. Laura Perez organized the event, and although it was about buses, there were some serious bikers there too that kept me busy explaining the longtail. In this photo I'm doing double duty- the Tee shirt I'm wearing is for Sierra Club's national "Ready for 100" campaign, which is about becoming 100% renewable energy powered by 2050. 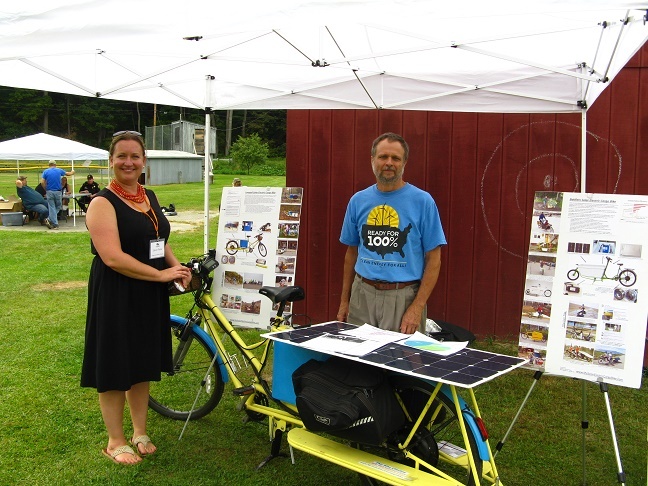 I helped with an Electric Vehicle Forum and Demonstration in New London, NH last month. They think it was the largest EV event in New England so far, but I think my event at the Montshire museum was bigger (both were around 250 people). I may have overstepped a little, holding my sign saying "I'm ready for electric cars in NH!" since I'm a Vermont resident. Oh well, New Hampshire is a bit behind the curve and needs a push. Last April several state organizations organized a Youth Climate Day at the Vermont capitol building, and close to 500 high school students stood on the capitol building steps and called for climate action. 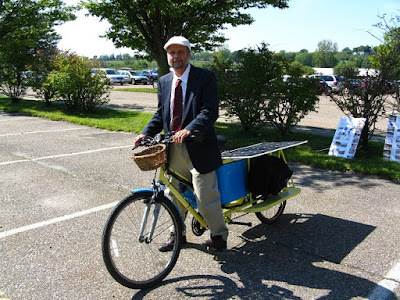 I brought the bakfiets along with some carbon emissions information that I've been using for Sierra Club and EV work. This is my legislative representative John Bartholomew, who I hope gets re-elected because I've been training him for months to introduce an incentive bill for working bikes to the legislature during the next session. By coincidence it turns out that Sierra Club has built a very strong national Electric Vehicle program because of the damage that transportation emissions are doing to our environment. (SC is one of three main sponsors of National Drive Electric Week.) 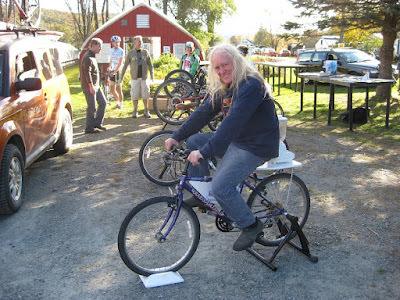 I have fallen into the role of the EV person for our Vermont Chapter because of my bikes and car knowledge. It's been great fun. I've gotten to be part of the state VW Diesel Emissions Settlement comments, as well as part of a federal National Labs study on EV programs, and also sign a state letter to the California Air Resources Board (CARB), (because California's vehicle standards affect our Vermont vehicles through the Zero Emissions Vehicles Memorandum of Understanding (ZEV MOU) that we are part of). I've also learned about the Transportation and Climate Initiative in 12 states, which is working along with NESCAUM to implement a Regional Greenhouse Gas Initiative (RGGI) for transportation. In all honesty though, I have to say that an EV is still a car, (and a self driving car is still a car), and we will continue to have congestion and resource problems with them. The native mode of transportation for humans is walking, and we have built a system where 4800 pedestrians die each year in the US. In urban areas our interstate highway system is obsolete. We need a new vision of transportation. In the meantime EVs can be extremely impressive cars, and I'm happy to support them during a transition to better transportation. A summer ago Drive Electric Vermont worked on the "Drive the Dream" campaign, which promoted Work Place Charging (WPC). This has been shown to be an important step in building EV infrastructure, and there were 22 large businesses that agreed to put in vehicle charging stations for employees. 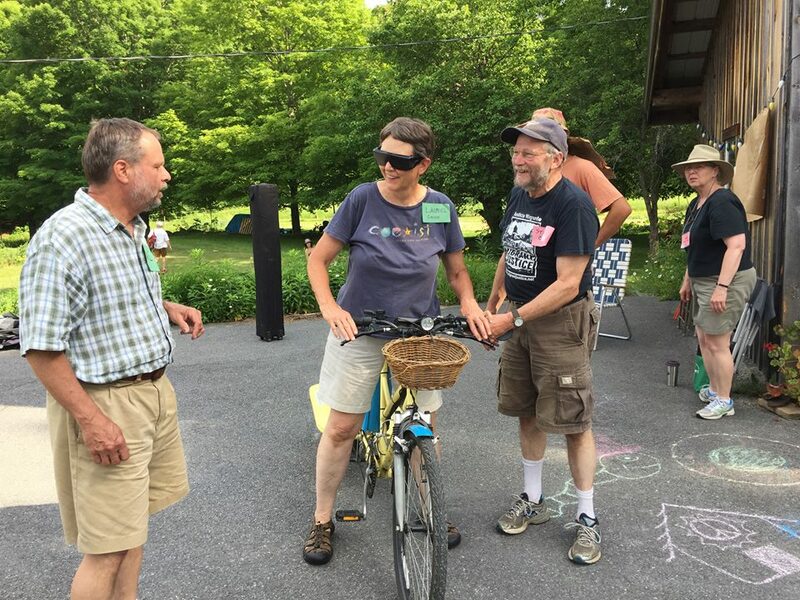 They held a conference at the end of the program at the Vermont Teddy Bear company, and I got to bring my bike. In this picture Vermont Teddy Bear CEO Bill Shouldice and Governor Peter Shumlin are talking to the press about the program. Democratic Governor Shumlin has been strongly supportive of EVs, but it was actually his predecessor Republican Jim Douglas that initiated our state EV work. And what does all of this mean to the person in the street? Sometimes you have to wear a suit while Driving the Dream. Yesterday I took the frame for the third bike over to Sculpturefest. It is now ready for paint, but the bright shiny metal at this moment looks like one of the sculptures in the show. There were about 50 elementary school kids visiting, and I got to talk with them about making bikes, bending and welding tubing, cargo boxes, electric motors, and solar. Two of them even asked for my autograph! (I signed, but told them it wasn't worth anything.) It was a blast, and they asked some very good questions- several of the second graders were expert bike riders already, and figured out the electric drive right away. It's time to put in some more bike lanes.